The New York Public Library (NYPL) had a companion exhibition to Blue Prints: The Pioneering Photographs of Anna Atkins (find my review of the catalogue produced at this occasion here). Entitled Anna Atkins Refracted: Contemporary Works, it showcased artists whose work could be seen in relation to Atkins’, many — but not all — of them using the cyanotype process. Of these, my favourite pieces were made by Meghann Riepenhoff, in particular the algae ones. At first I was baffled and most curious: how do you create cyanotypes that feature all these colours? Walking closer, I realized how: you don’t. Or rather, Riepenhoff had followed Atkins’ lead, placing algae on sensitized paper — without ever removing the specimen. For Atkins, this would have constituted a bad mistake. After all, her goal was to produce images that would be allow themselves to be used in a scientific context. Here, though, the assemblages shone most gloriously, with a variety of shapes of all kinds of colours sitting on top of the cyanotype outlines of the plants’ original shapes. “Of course!” I found myself thinking — of course, this is how one would do this if one actually thought of it. It’s not scientific, and it’s probably iffy in an art-conservational context, but the idea of pushing the process further by adding the fragile materiality of the plants seemed entirely appropriate to me. I wish I had thought of that, but, alas!, I hadn’t. Over the course of the past few years, Riepenhoff has made use of the cyanotype process in a variety of ways. Other artists use cyanotypes simply as a way to produce photo-sensitized paper, the idea being that the final image — whether a photogram or a photograph — ought to be as perfect as possible: a photographic approach. Seen that way, the cyanotype is not that different than a platinum print, except that, of course, the latter is a lot harder to produce. Riepenhoff, however, focuses her attention on the material itself and on the way it might develop, given exposure to light under conditions that defeat all chances of getting anything photographic. There is, in other words, ample chance involved, and the resulting images don’t look like photograms, let alone photographs. It shudders me to think someone might use this fact to contest the photographic nature of the work (following how large parts of photo history have mistreated Atkins) — if they do, I honestly don’t want to hear about it. For Ecotone, a sensitized sheet of paper might be placed on top of a tree’s branch, resulting not only in a specific pattern of exposure but also in parts of the photosensitive emulsion getting prematurely washed away by rain. Littoral Drift uses a somewhat similar approach, except here the sheets of paper are laid out at the edge of the sea, and the moving water — the waves — will produce an unpredictable pattern as it washes away the emulsion while the sun’s UV light does its job. In both cases, the resulting images contain abstract patterns, with the process leaving more of a trace in Drift. 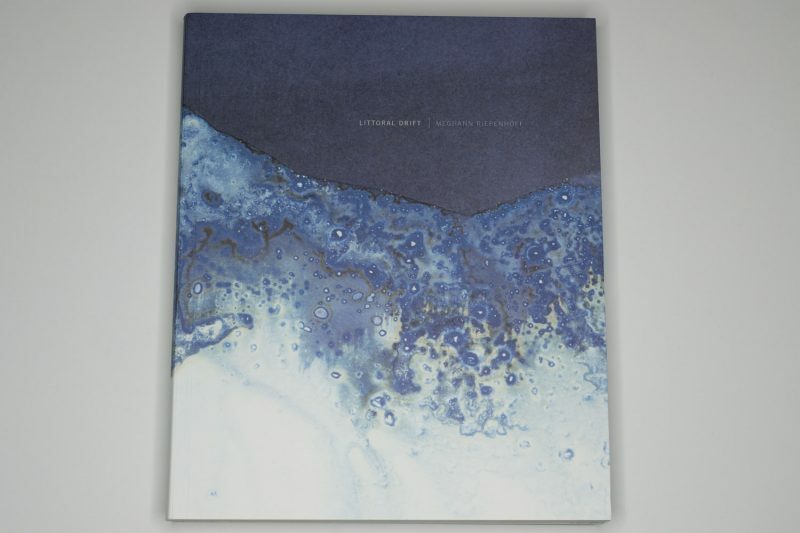 A new catalog — Littoral Drift + Ecotone — now presents these bodies of work to a larger audience. As is, the images suffer from the same problem that is so well known from the world of painting: many of them are simply too large to allow for life-size reproduction in a book. This is especially true for the largest assemblages, which comprise of dozens of individual images grouped together. In addition, there is a surface quality to the images that while not reaching what is common in the world of paintings still is integral to the work. The catalog does a very good job conveying the various qualities of these two bodies of work. Separated into two joint volumes (the publisher’s website calls this a “Z binding”), the viewer gets to experience the images in a variety of ways, whether in the form of reproductions, details, or as installation photographs in which the presence of viewers gives a sense of scale. A variety of gatefolds allows for the presentation of images whose shape cannot be fit easily into the catalogue’s vertical rectangle. The production value is high, making for an immersive experience. It’s a hefty package, though. Even though it’s “only” a 11×13″ (27x33cm) book with a total of 224 pages it feels like a lot more (I’ve found its weight listed online as almost 7 pounds). In fact, after looking through it a few times, I was surprised it was only 224 pages. Somehow, it had felt like a lot more. And this really is the one thing that I’d say for me isn’t quite right here: it’s just too much. This could have been a simpler one-volume catalog with fewer images, without anything being lost. The whole package feels excessive without there being a real reason for that. This quibble aside, I thoroughly enjoy being able to engage with Riepenhoff’s work now, without having to travel to some museum or gallery. I tend to have qualms about processed-based photography simply because all-too-often, it becomes too centered on its own process, too centered on its maker’s craftiness or cleverness — too often, in other words, it stays in the realm of photocraft without being able to do more. This concern doesn’t apply here. Interestingly enough, the work is about the underlying process, yet at the same time, the resulting images are lifted out of it. Riepenhoff’s ability to exceed photocraft is also what made her work stand out in the NYPL exhibition: it’s clever while it doesn’t just stay clever, it’s crafty while it doesn’t just stay crafty, and it’s process based while also being more than that. Being able to do that is quite an achievement.